U.S. government debt yields added to the week's steep losses Friday as bond traders lost confidence in the strength of the U.S. and global economies just days after the Federal Reserve downgraded its own forecast. The recent downturn in long-term debt yields triggered an inversion of part of the Treasury yield curve, the plot of interest rates of bonds having equal credit quality but differing maturity dates. An inverted curve — and especially one between the 3-month yield and 10-year yield — is considered an important recession indicator. At 4:35 p.m. ET, the yield on the 3-month Treasury bill was 2.459 percent while the yield on the 10-year Treasury note was 2.437 percent, according to Refinitiv TradeWeb data. Friday marks the first time since 2007 that spread has been in negative territory. The decline in the 10-year yield pushed it to its lowest level since January 2018. The Friday moves add to steep losses on the week for U.S. Treasury yields. The 10-year rate finished the week about 16 basis points below where it traded on Monday. The 30-year yield slipped nearly 15 basis over the same period. The German 10-year bund traded in negative territory. When investors expect a healthy economy, the yield curve slopes upward: Those that agree to take an IOU from the U.S. government for years are compensated with better interest rates than those who loan money for a matter of months. However, its usual upward shape can change when investors think economic output growth is likely to fall. For example, if traders believe Americans will produce fewer goods and services in two years than it will in two months, the curve can invert, or slope downward. The rise of short-term yields above longer-term yields is often viewed as a recession predictor, though technical analysts view inversion of certain sections of the curve as more critical than others. 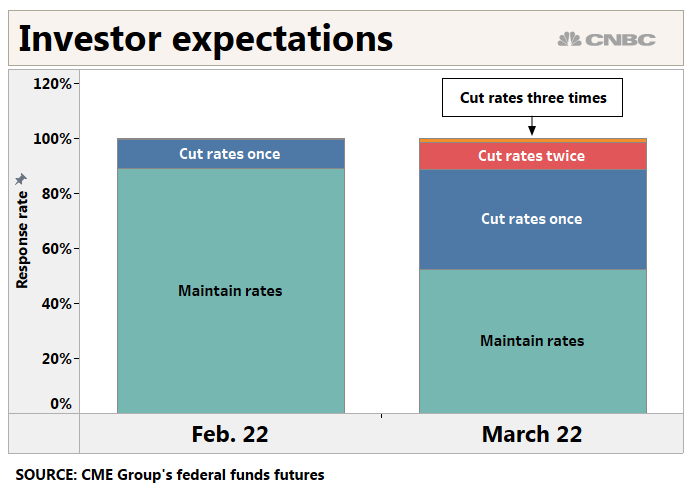 "I'd highlight that the 3-month to 10-year spread is important because the Fed has done a lot of research on which best predicts future recessions and it found that one to be preferable," said BMO Capital Markets rates strategist Jon Hill. Hill added that while that the recent inversion does not guarantee a recession, BMO's work on the Cleveland and New York Fed's models suggests a 30 percent chance of a recession in the next 12 months. One of the most popular spreads to watch across Wall Street is that between the 2-year Treasury yield and the 10-year Treasury yield, which remains positive. "It's actually not 10s to 2s: it's 10s to 3-month Treasury bills," Kudlow said in May. "Very important. And I actually went and got the model. The New York Fed is still publishing the model. The spread is flatter, but it's 100 basis points or so. It's not 20 or 30." Bond traders said the sizable move in Treasury yields shows both how much inflation expectations and economic growth expectations have receded over the past six months. The Fed on Wednesday downgraded its forecast for the U.S. economy, adding that it plans to end its program of reducing the bonds and mortgage-backed securities it holds on its balance sheet. Investors viewed the central bank's release and comments from Chair Jerome Powell as more dovish than expected.